Once again, South By Southwest was a much different experience this year. The past six years I’ve always had one of two people by my side, and usually both: PtheStudP and Johnny Goodyear. For the first time, our SXSW pact was broken due to circumstances out of their control, leaving me reeling and unsure whether I could do the festival all by my lonesome. Fortunately, after making a phone call to my longtime friend Sewer, I was able to coax him to join me for the week, and as an added bonus, my other friend Doon would also be along for most of the festival. 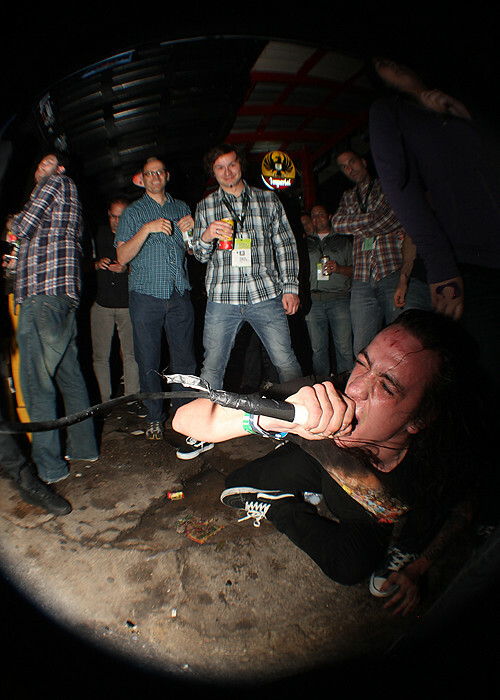 After a week of great shows, free beer, and nightly stops to the Sausage King, here is my list of the best and worst of SXSW 2011. At first glance, you would think that a Showcase held by Van’s would be an emo-scream-o nightmare based solely off of the rosters they’ve organized for the Van’s Warp Tour the past few years. 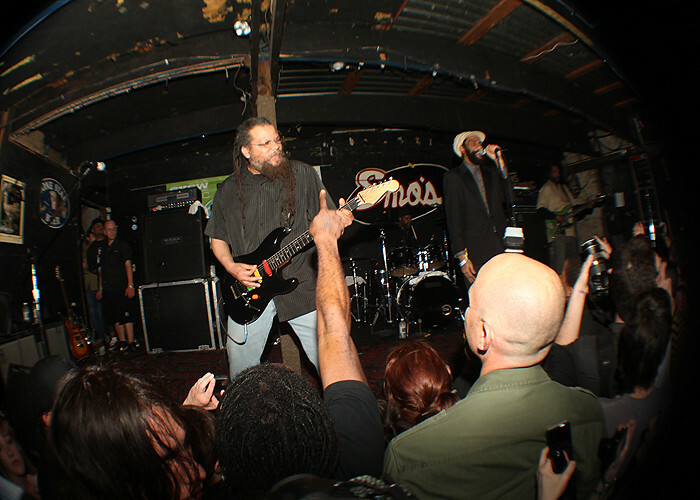 But the likes of Bad Brains, OFF!, Trash Talk, and Black Lips made for a pretty impressive, multi-facted line-up, running the gamut of what punk rock can be. Whether it be Trash Talk’s rage against melody, OFF!’s resurgence of Black Flag’s crunch, Bad Brain’s fusion of reggae-punk, or even Black Lip’s punk rock take on the 50s and 60s – there was something for everyone in this punk buffet. Trash Talk took their act to the crowd. Trash Talk impressed with a rip-roaring show filled with sweat and stage dives. Their fill-in bass player deserves recognition for stepping into the slot of an injured Spencer Pollard who was stabbed last week in a hate crime. Black Lips sounded as jangly and fun as ever, although singer Cole Alexander was tame in comparison to the legends I’ve heard of their performances. Bad Brains seared through classic after classic, and I would challenge to say they sounded better than they did on classics like “I Against I” and “Rock For Light”. Okay, I’m getting a little ahead of myself, but they were pretty damn great for a bunch of old dudes. The highlight of the show though was OFF! with Keith Morris growling and roaring complaints and allegations. He stalked the stage, back and forth, like a man possessed, and if it weren’t for the giant bald spot hidden beneath his five dreads, you’d think they were a group of teenage punks transferred from 1979. She looks excited, doesn't she? To say the Van’s Showcase was perfect would be a lie. While I can’t speak for the closer Talib Kweli since we left to go see Pete and the Pirates (more on them in the next post), the opening band The Stripminers were possibly the worst band I’ve ever seen in SXSW history. Being a “side-project” for The Donna’s Brett Anderson and the Radishes Paul Stinson, The Stripminers not only sang milk-toast-pop-rock fit for the Jonas Brothers, but they were so devoid of charisma that they came across as a vacuum for all that is fun. I understand that this was one of their first shows together, but you could feel so much tension between the members on the stage that you would swear they are a band of veterans on the verge of a break-up after years of touring. Nope. They announced their new project in February. It became obvious quickly that Anderson was the alpha of the group, and the others stayed away from here and avoided eye contact as to not to disturb the sleeping dragon (she didn’t even help the band break down the stage after the show). Mid-show, we tried heading next door to Emo’s Jr. to see a better band, but we were greeted by the rap-metal band Skrew – proof that the curse of Fred Durst still lives. We decided to return to The Stripminers because at least their miserable performance was funny in a “Piranha 3D” kind of way while Skrew were bad in the vein of “Grown-Ups” (has there ever been a more painful film to watch?). When we came back to The Stripminers, their crowd had completely evaporated, and Anderson’s request for clapping resulted in only the sound of crickets chirping. At one point she looked right at Sewer and I and scowled when she saw the two of us laughing directly at her lackluster performance. I should probably feel bad about that, but for some reason, I don’t. On Thursday night, when the opportunity to see OFF! arose, Sewer wanted to check them out a second time (plus, Doon had joined us and we both agreed he had to see them). With Megafaun playing next door at the same time, I figured I had an obligation to pay my respects to the guys who wrote and recorded “Gather, Form, & Fly”. Worried I wouldn’t get in, I left my friends around nine and arrived just in time to catch the Minneapolis band Leisure Birds. I enjoyed their set, but between songs I’d catch a glimmer of punk rock anthems echoing from the “neighbor’s” yard. After four songs, I decided I had to revisit my friends next door to see what all the commotion was about. When I walked through the entrance I found what looked to be five Puerto Ricans hopping around while the singer howled out unintelligible lyrics. Despite the language barrier, the riffs spoke straight to my gut, rumbling for more and pushing me toward my friends who were already taking in the lively set. Without my old partner PtheStudP around, I didn’t expect to find many new bands, but fortunately I waltzed into the Club DeVille to catch the last half of Davila 666’s set (and I still even got to see Megafaun). I’ve already written a blog on this (see Sunday’s “Video Clip of the Week”), but I can’t deny that Ben Weasel punching two women during what may be Screeching Weasels last show ever will forever be tied to this year’s SXSW. Looking back, I can’t decide whether it was a horrible moment or punk rock at its finest (hear me out…). Ben spent 50% of the set complaining about money, SXSW, bloggers, their label, YOU NAME IT. He alienated the majority of the audience by the show’s end, so it’s no wonder that the crowd began tossing beer and ice toward him. In the end he punched two women, something I would never condone, yet I can’t help but feel he pulled an Andy Kauffman on all of us, playing our emotions and leading us toward the type of lowly, unrestrained behavior that punk rock has been missing for a while now. I bet even he realizes he took his angst just a little too far. 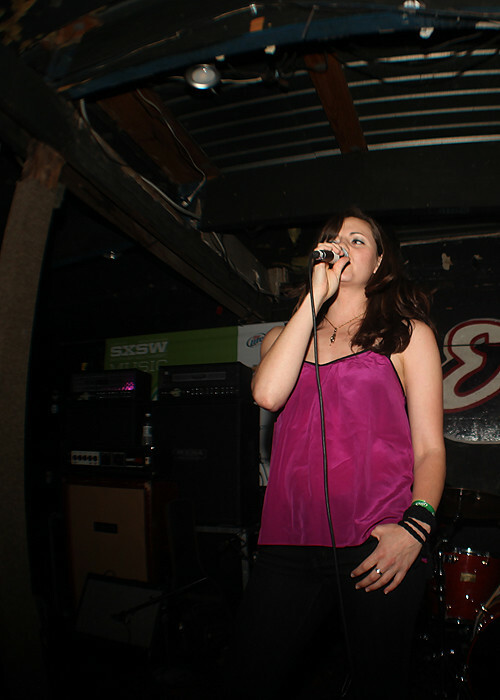 A few weeks before SXSW 2011, a new venue began popping up on all the day showlists – East Side Drive-In. At first I figured it was just another dude letting bands play at his house a la The Church of the Friendly Ghost, but then suddenly I saw a shocker: Pitchfork was breaking their tradition of doing their parties at Emo’s, opting for this mysterious East Side Drive-In. It had to be more than just a house, and unfortunately, it was. I didn’t make it to the Pitchfork show, but I did head out to the east side of the interstate to check out the Fun Fun Fest show at the Drive-In. When we arrived, we came to find a desolate, dusty field with the type of stages you’d find at a Warp Tour. It looked like a music festival with a food court area, and tents for beer and liquor. The fact that it was also a free show on a Saturday resulted in a crowd of undesirables. Large crowds, sprawling venues, and food courts: this is exactly what SXSW is not about. There is not much I can say other than I still adore Lovejoy’s. It may not have the best stage, but everyday you can guarantee that they will have great free beer on tap. There’s no better way to start each day then with a beer by the likes of Dogfish Head, Flying Dog, and Left Hand. Not bad in comparison to NPR’s day show offering of one free PBR. Shockingly though, Lovejoy’s didn’t have best free drinks of the week. The Rhapsody Rocks show at the Club DeVille take that honor, offering up an endless supply of free Guinness, Red Stripe, and Jeremiah Weed. But the free stuff didn’t end there: free posters, t-shirts, bottle openers, pancakes…it seemed like each time you strolled to the port-a-potties a new goody would appear on the table. Oh, and the show was pretty damn sweet as well. Anytime you kick your show off with Ty Segall, there’s no doubt that someone knows what they’re doing. How do you follow Ty Segall up? Kurt Vile and the Violators isn’t a bad choice. In fact, ever since seeing Vile and his band put on a mesmerizing set, I’ve listened to “Smoke Ring For My Halo” a total of seven times. With his mellow melodies, I swear he put a trance on me (but I don’t mind). Starting your day party with Ty Segall and Kurt Vile is like having Cliff Lee and Roy Halladay as your starting pitchers; no need for a bullpen. I returned to my friends after Vile and we half listened to Small Black and Glasser for the next few hours, although our main focus was on that magical black concoction known as Guinness and conversation that led to excessive laughter. Around four, the venue began to fill up quickly, signaling the sign that the monsters of indie rock were about to close the show out: yes, my friends, this would be the only Deerhunter show at SXSW 2011, and we were there to see Bradford Cox and company do there thing. Despite the excessive crowd, we were able to get up pretty close and catch the band under the shade of the tent canopy while all the other onlookers sweated away in the warm Texas sun. The band took their constantly morphing guitars to a new level, bringing classics like “Desire Lines” and “Nothing Ever Happened” to uncharted territories. At home, I play Deerhunter and focus on the lyrics of loneliness and desperation, but on this day of great music, great beer, and great friends, I listened to them and felt strangely happy.